What’s the Herald got to do with me, the Triumph sports car owner? The first Herald to go on sale to the general public in April 1959 was what has long since become one of the rarest versions: The Coup&eacute. Not quite a full four-seater (in fact, the rear seat was an option), the car nonetheless was equipped with features quite familiar to British sports car fans: four speed transmission; 948 cc engine with twin SU H1 carburetors and an output of 50.5 bhp gross/42.5 bhp net. Some features of the new car were considered quite novel at the time: independent rear suspension; an incredibly tight turning circle (25 ft.); “collapsible” and adjustable steering column; and a greatly reduced maintenance schedule through use of nylon and rubber bushes that virtually eliminated grease fittings on the chassis. The Coupé was soon joined by a Saloon version, which allowed rather more room for a full rear seat. The Saloon was originally powered by a single Solex-carbureted, 38.5 bhp gross/34.5 bhp net version of the same 948 cc engine, though later the twin-carb engine would be offered as well. By March 1960, these two models were joined by a Convertible, which also offered a top that folded almost completely out of sight, a full (though a bit cramped) rear seat and the twin-carb engine. 1960 also saw the introduction of the Herald S, a stripped-down saloon that never caught on. Bigger news the following year was the introduction of the 1200 series, incorporating the same Coupé, Saloon and Convertible body styles with a larger engine and somewhat more relaxed final drive. Soon added to the range was an Estate Wagon and the short- lived Courier van, a “commercial” version of the Estate wagon much like the once-common sedan delivery versions of American station wagons. A further upgrading of the 1147cc engine came with introduction of the 12/50, a 1200 Saloon with 51 hp engine, folding sunroof, different grille (seen later in the U.S. on the Sports 1200) and uprated trim. Improvements continued, with all Herald 1200s eventually receiving the sturdier frame seen first on the 12/50 (and earlier on the Vitesse six-cylinder derivative) and a 48 hp version of the 12/50 engine. By the end of 1964, the Coupé had disappeared, perhaps falling victim to the popularity of the Spitfire! 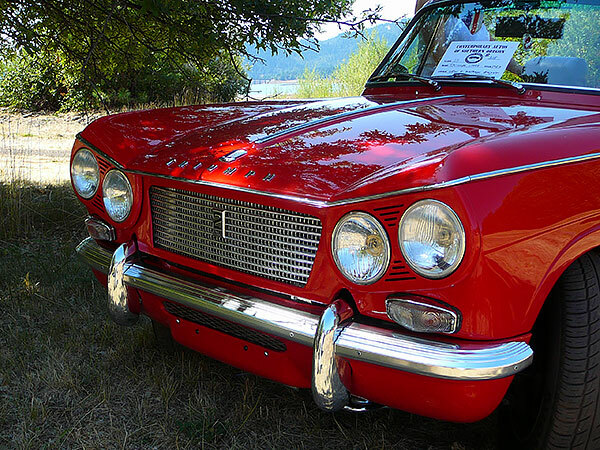 In 1968, facing competition both from other marques and other models in the Triumph range, the Herald received a final, major upgrading. More power came from a single-carb version of the 1296cc Spitfire Mk.3 (and Triumph 1300) engine, and a front-end restyle came from adapting a variation of the Vitesse sheetmetal. Improvements were made also to the interior and drivetrain components. The resulting 13/60 came, as before, in Saloon, Convertible and Estate Wagon variants, replacing all previous configurations of Herald save the 1200 Saloon, which continued as before. Sales of the 1200 quickly dropped off, though, while the 13/60 models were more successful for a time. By 1970, the rear-drive Triumph Toledo and front-drive 1500/ 1500TC were too much competition. The 1200 Saloon disappeared in May 1970, followed by the 13/60 Saloon in December and the Convertible and Estate cars in May 1971. Meanwhile, back in 1959 and the introduction of the Herald, any number of new models, projects and prototypes were being considered by Standard-Triumph. One of these was an engine project — a six-cylinder engine derived from the SC/Herald engine (the engine that ultimately was to power the 2000 and TR6 models). By 1960, Triumph engineers had shoehorned a 2-litre version of this six into a modified Herald Coup&eacute. The concept caught on, at least within the Triumph organization. No one expected sales to be exceptional, and the cost to bring the car to production was fairly low, so the car looked to be profitable. Major changes from the original Herald involved new front styling from Michelotti and a reworked, sturdier chassis frame (later adapted on Heralds as mentioned above). When the Vitesse was launched in 1962, it featured a 1600cc engine rather than the 2000cc engine of the first prototype, and the car was offered only in Saloon and Convertible versions. Lagging sales of the Herald Coupé were to blame for the lack of a Coupé in the Vitesse range. In 1965, the substitution of Stromberg sidedraft carburetors and manifold from the 2000 for the original Solex setup resulted in a significant gain of horsepower, acceleration and fuel economy. By 1966, the Vitesse had been significantly upgraded in the face of increased competition, primarily in sharing a 95hp, 2- litre motor and other components introduced in the new GT6 , all-synchromesh transmission (developed originally for factory Spitfire rallye cars), sturdier axles and differential, larger front disc brakes, and the 4.5″ wide wheels used on Courier, GT6 and 2000 models. By this time, though, the limitations of the swing-axle rear suspension were noted more and more both in the Vitesse and GT6. Although the now-familiar swing-spring fix had been around since the beginning of the Herald line in 1959, it was not applied until 1971, and then only to the Spitfire. Instead, a double- jointed half axle setup was designed, utilizing the same transverse spring but adding a lower wishbone and rotoflex couplings and relocating the trailing arm and shock absorbers (now lever type on the Vitesse). The Vitesse 2-litre Mk. 2, introduced in late 1968, incorporated this change along with a further increase in horsepower, gained from a different camshaft and use of the “full-width” cylinder head. (The GT6 Mk.2 — or GT6+ in North America — also shared these improvements.) As good as the car now was, though, it was perhaps a bit late in coming. Sales tapered off steadily; the last Vitesse was built in May 1971, only weeks before Dolomite production began. Before you American fans get too excited about some of these models, please be advised that the above descriptions don’t necessarily apply to the United States market. The Herald Coupé was dropped in the US well before the end of its production run. The Estate car was never officially imported (a mistake in the opinion of some), nor was the 12/50 (the sunroof feature alone might have been a great boost to Herald sales in this country). 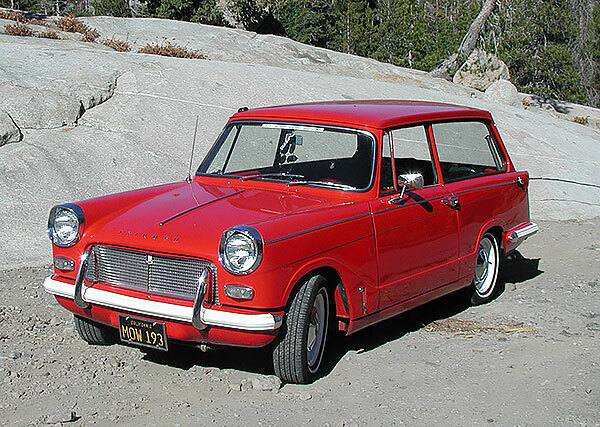 Interestingly enough, the Herald 1200 name was replaced in the U.S. during the 1964 model year by “Sports 1200”; the latter featured the home market 12/50’s grille and a 48 hp. version of the 1147cc engine. Trunk badging noted the change. By the mid-1960s, marketing of the Herald was not a high priority. What advertising there was often referred only to the “Triumph 1200,” with no reference to the Herald or Sports names. If you would like your page added to this listing, please contact the webmaster. After 25-35 years, it would not be a surprise to come across a Herald or Vitesse with major components whose numbers do not match the listings below. As components are easily swapped with their “sports car” counterparts, one might find, for example, FC- or FD-prefix components (Spitfire 4-Mk.2 or Mk.3) in Heralds, or KC- or KD-prefix components (GT6) in a Sports 6. Exterior: No handle on top of bonnet, but all models feature bright metal strip, now extending from heater intake forward, but extra bright strip around grille opening is gone; Coupe and Convertible still feature crossed-flags badge at rear upper edge of rear quarters; roof badges on saloons usually read “Triumph”; later Sports 1200 models identified by home market 12/50-style grille and “Sports” script badge replaces similar Herald badge on trunklid; front valence modified with additional air intake, rear valences now bolt on, and white rubber bumpers continue; Vitesse-style “Star” frame incorporated circa 1963; other running manufacturing variances incorporated as well; wheels — painted Spa White starting circa 1963 — received full wheel covers (actually sided left or right, and also seen on U.S. specification Spitfires) in about the 1964 model year. Interior: dashboard still of molded pressboard, but most often covered by black padded vinyl, and now featuring a polished wooden facia; glovebox gains a door, but hinged “chip basket” is gone; black-faced gauges — large speedo w/fuel gauge and separate temp. gauge in all models; black steering wheel, column, switches, knobs, window winder knob now black, and black escutcheons for window winder and door handle; upholstery usually solid color throughout, seat backrests are much thicker than on 948cc models, map pockets are gone from convertible door panels. Interior: as Herald 1200, except: in the latter part of 1963 a revised dashboard featured a smaller speedo with a matching tachometer and separate fuel and temperature gauges, and a large map pocket was added in the passenger footwell. Herald (948cc.) The G prefix denotes single-carburetor engine, Y denotes twin-carbuetor engine. The G (4.875:1 ratio) and Y (4.55:1) prefixes were similarly used on rear axle units. Gearboxes carried the G prefix. Herald 1200; Sports 1200 The GA prefix is most commonly found on engine, gearbox and rear axle (4.11:1). Prefix letters GD may also be found on engines; this denotes either the 48 hp. or 51 hp. version of the “12/50” engine. Herald 13/60 (not officially imported to the U.S.) The GE prefix is most often found on engine and rear axle; GA prefix continues on gearbox. Sports 6 (Vitesse 1600) The HB prefix, as used in Commission numbers, is also found on engine, gearbox and rear axle. Production Figures and Commission Numbers From Robson’s Herald and Vitesse. “CKD” stands for Completely Knocked Down; in essence a “kit car” shipped to some destination and then assembled locally. 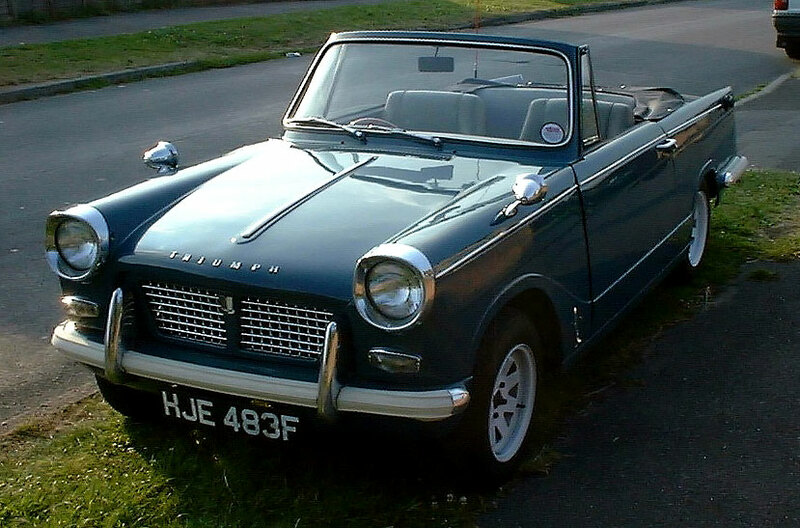 Due to the continuing, even increasing, popularity of the Herald and Vitesse in England, as evidenced by the strength of the Triumph Sports Six Club,availability of spares is not so bad as one might expect. Many basic mechanical items — brakes, engine and drivetrain, suspension, electrical — are identical or similar to the Spitfire (for Herald) and/or the GT6 (for Vitesse/Sports 6). This also opens the door to any number of potential updates or performance enhancements. For example, it would be a virtual bolt-in procedure to update a later Herald 1200 to Spitfire Mk.3 or better specification. As one might expect, some original specification spares for the 948cc cars are scarce, unfortunately including such basic maintenance items as oil filters. Parts common to other vehicles are, of course, available through a number of U.S. vendors: The Roadster Factory, Victoria British, Moss Motors, etc. For items unique to Herald or Vitesse, a number of British vendors offer comprehensive spares service: Canley Classics, Rimmer Bros., etc. In addition to the items listed in the general Triumph Buyers Guide , there are a number of specific items of interest on the Herald/Vitesse. 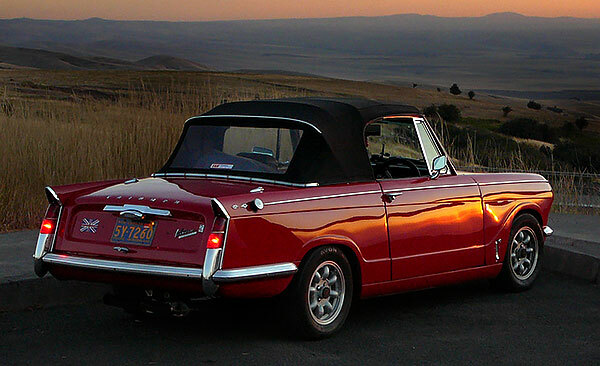 Assessing a Herald or Vitesse for possible purchase is very much like assessing any Triumph. Due to the many mechanical similarities, most of the same strengths and weaknesses of GT6s apply to the Herald/Vitesse range. Engine: The engines generally took a lot of punishment, but ultimately that punishment shows in wear of cylinder bores, crankshafts, main and big-end bearings, thrust washers, etc. Expect to pay about the same for a rebuild of a Herald engine as you would for the nearly identical Spitfire engine. Some 948cc engine parts are becoming scarce.) On the six-cylinder, check carefully for all the same sorts of problems common to GT6 and TR6 engines. 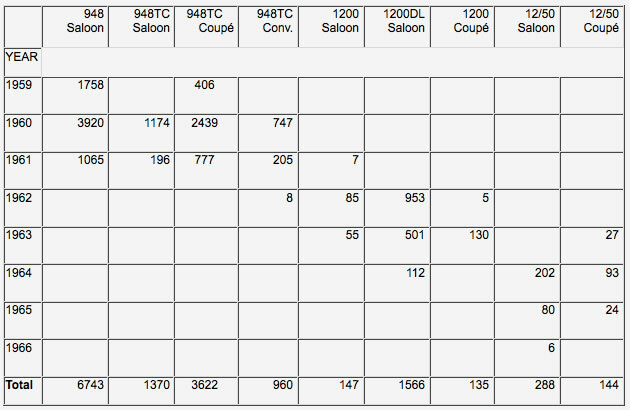 Again, rebuilding costs are about on a par with other Triumph sixes, and some 1600cc parts are scarce. Transmission: The Heralds used a transmission virtually identical to the Spitfire, and the usual problems are likely to be found, especially with worn synchros and damaged gears from those who never mastered the “double-declutching” necessary to engage a non-synchro first gear while moving. Don’t be fooled, though, by a sloppy shift lever. A $20 bushing kit will quickly cure that problem, as it will on the GT6 and pre-1975 Spitfires.With the 1600cc cars, the transmission was very similar to the Herald, but with different gearing. If you encounter a non- running Sports 6/Vitesse 1600, there’s a fair chance that the transmission is in poor shape (from being marginally able to cope with the six). There is also a fair chance that it is missing completely; early Vitesse gearboxes were often pirated by racers of Spitfires, the Vitesse ratios serving as an ideal “close- ratio” gearbox for racing! Brakes: The electrical and hydraulic systems of these cars will show no surprises for those familiar with other Triumphs or indeed any other British-made cars. The rear brakes of the Herald are, for all intents and purposes, identical to those of the Spitfire. The same holds true for the front disk brakes. As parts changed on the Spitfire (such as the larger calipers used from the Mk.3 Spitfire on), they changed as well on the Herald. Similarly, the brake parts used on the Vitesse/Sports 6 parallel those used on the GT6 models. Interchangeability is even found front-to-rear in a sense: if you encounter trouble locating a front brake drum for a Herald, look for a rear drum from a GT6! Chassis/Frame: One of the most critical parts of any car is, of course, the chassis; the Herald/Vitesse line is no exception. The frame is especially critical on these cars in that their construction and strength are based on large sections of the bodyshell bolted to each other and to the frame, unlike the largely welded-up bodyshells found on most other Triumphs. Unfortunately, these cars seem to have been extraordinarily susceptible to rust in the chassis, especially in areas where salt was used during the winter.Any Herald or Sports 6 chassis should be checked carefully for rust, which usually appears first in the rear frame extensions that support the trunk. Next, and even more critical, are the outriggers and side rails (which appear much as the names suggest) off the main backbone. The rearmost outriggers often disintegrate, taking with them the radius arm mount for the rear axles. Needless to say, this leads to handling unpredictable at best, deadly at worst!Due no doubt to the great popularity the Heralds and Vitesses still enjoy in England, many repair pieces are available for the chassis. Unfortunately for those of us in North America, one is more likely to encounter a Herald or Vitesse with chassis repairs that are well-intended, but perhaps lacking in strength or quality, or one in dire need of repair (see story in TVT #57). Proper repairs ideally require quality NOS or reproduction pieces, body removal from the chassis, careful fitting and alignment and quality welding of the pieces. But will your kids like it? Like most other Triumphs, Heralds and Vitesses truly come from an earlier, simpler time. Even at its introduction in 1959, the Herald was at once quite advanced (independent rear suspension, reduced maintenance, etc.) but archaic (separate frame at a time when many builders of small cars were turning to unibody construction). Thirty-five years later, the cars seem absolutely primitive compared to most current economy cars. Certainly the earliest Heralds in particular are not ideal for long-distance travel on the Interstate. It probably is best to look upon them the way many of their original owners did — as second cars: the Convertible offering a bit of sportiness over the family station wagon or four-door sedan, but with enough room for two adults and two children; the Saloon offering economical, reasonable closed comfort for four (not to mention the practicality of the large trunk and, on 948 models, a fold-down rear seatback offering a long and almost-flat load area); or the Sports 6, with the six-cylinder smoothness, if not the all-out horsepower, that most contemporary American cars offered, in a distinctive, small package. It is a certainty that you won’t see yourself coming and going, even at a car meet. 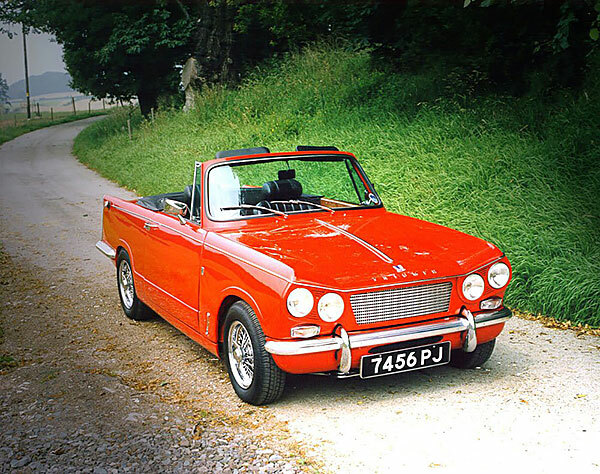 Likely as not, Heralds and Vitesses will be outnumbered even at Triumph meets by Mayflowers, long- door TR2s and documented ex-works competition cars. That’s part of the fun. It’s also a safe bet that you won’t put your children through medical school with profits from the eventual sale of your Herald or Sports 6. 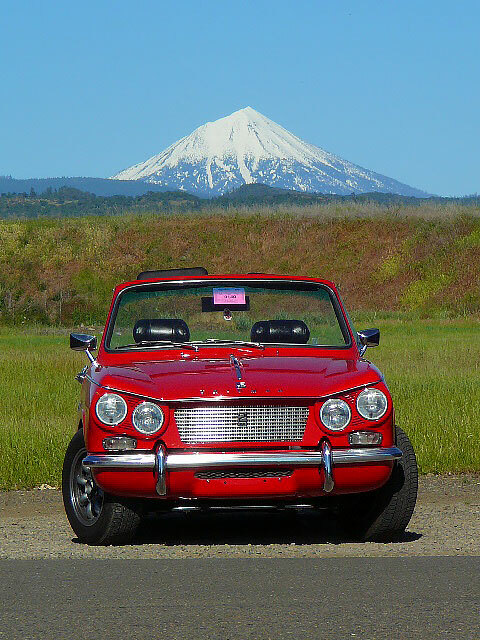 But it’s quite likely that you will enjoy driving “the economy car made by sports-car engineers” and knowing that you’re helping to preserve a part of Triumph history as unique and important as the sports cars. Many, many thanks to Dale Hickman of Hobart, Tasmania, Australia, Dale.Hickman@tres.tas.gov.au for providing the pictures and text below. Dale sheds some light on an Australian version of the Herald unfamiliar to most of us! Dale Hickman’s 12/50 Coupe. Note the Vitesse 1600 bonnet with the Triumph badge and TRIUMPH lettering in front of the chrome bonnet strip. I have a 12/50 Coupé (everyday car) and a 12/50 saloon (awaiting full restoration). Both of these are the Australian-assembled versions, which were fitted with the Vitesse 1600 bonnets and disc brakes as standard. The Coupé came with the twin carb setup as standard, while the saloon has the single Solex. I have been told that all Australian sold Coup&eacutes (presumably 1200s as well) were fitted with the twin SUs. It is interesting to note that it appears the 12/50s were not specifically marketed as a Herald in Australia as they do not have any Herald badges — simply the 12/50 badge on the boot and a Triumph badge on the dash in place of the Herald badge. My Coupé was manufactured in March 1965 from an exported CKD kit in November 1964 (after the production of Coup&eacutes ceased). It is also fitted with the early smooth roof [as opposed to the later style, with its “ribbed” sail panels]. I have found that there is little information published about the Australian version. The only article I have seen is a reprint of a Road Test from a “Wheels” Magazine in 1964. It is reprinted in the Brooklands Road Test book “Triumph Herald 1959-1971”. This article is on the saloon version but it does mention that the 12/50 range started with the introduction of the Coup&eacute. As far as I am aware, a convertible version was not offered. The 12/50s were assembled by AMI (Australian Motor Industries), who later went on to concentrate mainly on assembling Toyotas in Australia. Several years ago they finally were totally bought out by Toyota. Consequently all the Triumph records were discarded, but these are now with another Triumph fanatic. I have spoken to him and he has verified that my car is original. the 12/50 badge on the bootlid on the saloon is positioned identically to that on the UK model, but on the Coupé it is angled — presumably using the same mounting holes as the Coupé script badge fitted to other Coup&eacutes. The saloon had two-tone paint with the roof painted a different colour to the rest of the car. Australian versions were not fitted with the rubber bumper insets but rather had a smooth chrome capping on them (different from that fitted on Vitesses). The saloon was fitted with these front and back. I am not too sure about the Coupé as mine only has it fitted on the front. The rear bumper is simply painted. If it was originally fitted it must have been beyond replating when the car was rebuilt. front turn indicators are the inside lens on the Australian cars — all pictures of UK Vitesses I have seen show the amber lens to the outside. I consent to Triumph Club - Vintage Triumph Register collecting my details through this form.